Recognized for her iron will and natural disposition to tackle the toughest challenges, Dr. Blackburn decided to tread on unusual terrain… at least for those who know her girly side well! In January 2018, the one who had never hiked any mountain, no matter how modest in size — not even Mont St-Bruno! 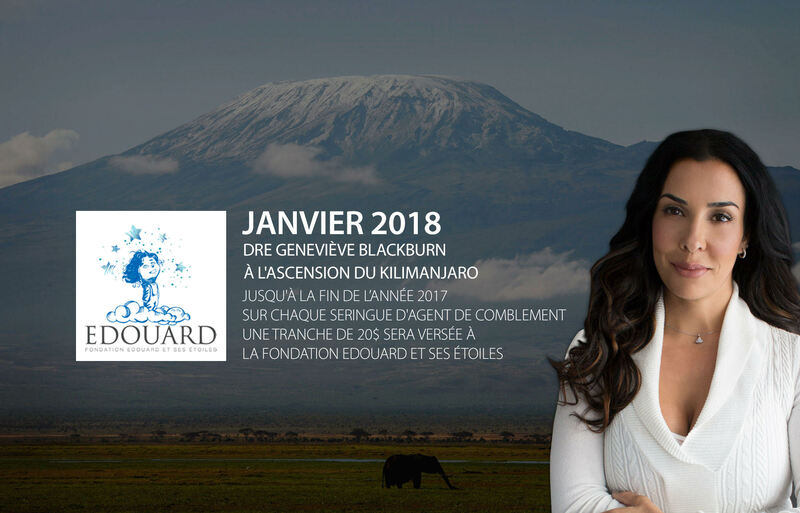 –, Dr. Blackburn decided to embark on an feat of extreme endurance that some of the most seasoned athletes would have a difficult time contemplating: climbing gigantic and majestic Mount Kilimanjaro, in Tanzania. One of the world’s highest peaks, the Kilimanjaro is a prized destination for extreme tourism. “When my friends told me that they were organizing this trip, I said immediately said yes, but I had no idea what I was getting into! Even the salesperson at the sports equipment store where I was buying my gear practically laughed out loud when I told him I was going to hike Kilimanjaro”, says, all smiles, Dr. Blackburn about prepping for this adventure in extreme travelling. As part of their quest, the group from Quebec with whom Dr. Blackburn went on this expedition had decided to raise funds for an important cause, the Fondation Edouard et ses Étoiles, benefiting children with cancer. With her generous spirit, Dr. Blackburn immediately got involved. And during the month of November 2017, for each syringe of fillers sold for enhancing treatments, $20 was given to the cause. When climbing a mountain as colossal as Kilimanjaro, the human body must adjust to the extreme variations in temperature – which can vary from 0 ° to -20 ° Celsius in a single day –, and also adapt to breathing air containing lower amounts of oxygen, which may cause altitude sickness, and can even be fatal in extreme cases. “Breathing becomes heavier, and the body produces more red blood cells. Once you reach the peak of the mountain, even speaking can be difficult. It makes you feel very much alone with your own thoughts,” explains Dr. Blackburn. Dr. Blackbrun’s teammates also describe how trying this feat of endurance can be for anyone. Despite the incredibly long hours of walking slowly (the guides kept repeating ‘pole pole’, which means ‘go slow’ in Swahili to tame the mountain without getting sick), “Gen was always super positive and humorous. She never hesitated for one second to help others overcome the side effects of mountain sickness, as well as the other unpleasant sensations that can occur at very high altitude. She always helped us keep our positive attitude.